The Tax Cuts and Jobs Act does not represent the plan FreedomWorks would choose if given the opportunity. We would rather see a flat tax rate and a large standard deduction, eliminating all deductions and loopholes in the process, or a consumption tax only system that makes everyone have some skin in the game. Unfortunately, that is not where we are. Because of opposition from Democrats, Republicans have been forced to use budget reconciliation to bypass the 60-vote threshold in the Senate to bypass a filibuster. The FY 2018 budget resolution passed by Congress, H.Con.Res. 71, includes reconciliation instructions that allow for a $1.5 trillion deficit, not including macroeconomic feedback, to produce a tax reform bill. Reconciliation is the only way to produce a tax bill that can pass the Senate with 51 votes. Any revenue losses over that static $1.5 trillion figure will cost the bill its privileged status and subject the bill to a 60-vote threshold. A score of the amendment to the Tax Cuts and Jobs Act by the Joint Committee on Taxation (JCT) shows that revenue would decrease by $1.413 trillion over ten years on a static basis, $86.5 billion under the maximum static deficit provided by H.Con.Res. 71. Separately, the Tax Foundation’s score of the Tax Cuts and Jobs Act shows revenues would decline by $1.98 trillion on a static basis and $989 billion with macroeconomic feedback, or dynamic modeling. According to the Tax Foundation’s model, the bill would increase gross domestic product by 3.9 percent, boost wages by 3.1 percent, and create 975,000 full-time jobs. These estimates are additions to the current baseline projections. On a static basis, the plan would lead to 0.9 percent higher after-tax income for all taxpayers and 3.3 percent higher after-tax income for the top 1 percent in 2027. When accounting for the increased GDP, after-tax incomes of all taxpayers would increase by 4.4 percent in the long run. The Tax Cuts and Jobs Act is not the perfect bill. It is a compromise. Republicans have become increasingly susceptible to criticism from Democrats, who have moved further to the left due to the influence of Sen. Bernie Sanders (I-Vt.). Additionally, the pushback from members of the Tuesday Group and other moderate Republicans from the northeast has caused problems on the proposed elimination of the state and local tax (SALT) deduction. 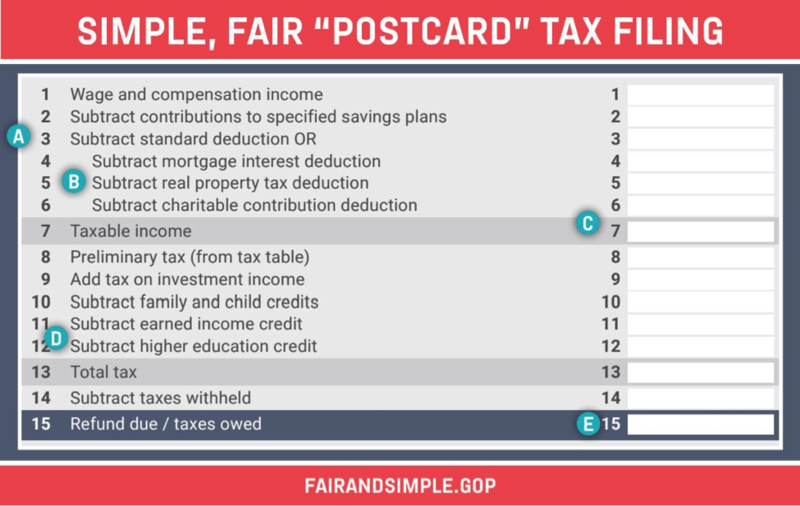 The simplification goal is generally accomplished in the bill, as most deductions are eliminated, but the tax cuts will go to only the middle class. The tax reform framework noted that “[a]n additional top rate may apply to the highest-income taxpayers to ensure that the reformed tax code is at least as progressive as the existing tax code and does not shift the tax burden from high-income to lower- and middle-income taxpayers.” Unfortunately, the bill keeps the existing 39.6 percent rate in place, although it does raise the income thresholds to which those rates will apply – incomes of $500,000 or more for single filers and $1,000,000 or more for married couples filing jointly. The release of the Tax Cuts and Jobs Act is only the beginning. The House Ways and Means Committee will begin the markup of the bill on Monday, November 6. The markup could take a few days to complete. It is possible that a substitute amendment will be offered by Chairman Brady on Monday when the committee begins its work, in addition to amendments that will be offered by members of the committee. The goal is for the bill to reach the floor of the House for consideration and final passage the week of November 13, before the Thanksgiving recess. The Senate Finance Committee, chaired by Sen. Orrin Hatch (R-Utah), is expected to have its own plan, which is almost certain to have differences from the House version, perhaps even significant differences. These differences will have to be reconciled in a conference committee before votes in either chamber on final passage. 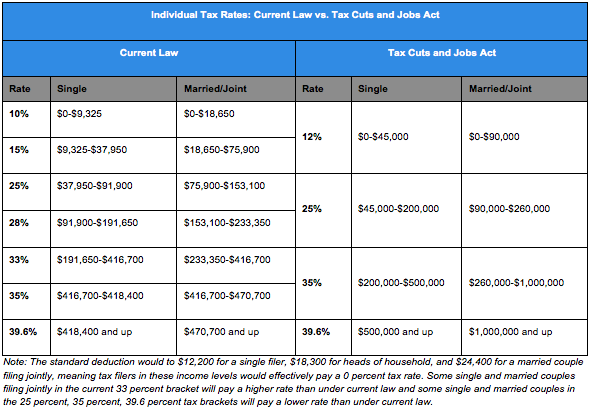 The Tax Cuts and Jobs Act consolidates the current seven tax brackets into four tax brackets. The near doubling of the standard deduction – $12,200 for an individual, $18,300 for a head of household, and $24,400 for a married couple filing jointly – essentially creates a fifth tax bracket. Tax brackets are indexed to chained CPI. The proposed tax rates may be unappealing or frustrating to many free marketers. After all, the those who earn the most in our society are already shouldering the income tax burden in the United States. The top 1 percent of income earners represent 20.6 percent of adjusted gross income (AGI) and pay 39.5 percent of all income taxes. The bottom 50 percent represent 11.3 percent of AGI and pay 2.75 percent of all income taxes. Economist Dan Mitchell graded the Tax Cuts and Jobs Act and gave the individual rates a “C+,” calling the rate reductions “relatively timid” and “disappointing.” But he noted that the rates were “not unexpected since lower individual tax rates mean considerable revenue loss.” Given the maximum $1.5 trillion deficit authorized by the FY 2018 budget resolution and the corporate and small business tax changes, there is little wiggle room on the rates. Another factor coming into play is that President Donald Trump has pledged that the tax bill would not cut taxes for higher income earners. The House Ways and Means Committee may address this “bubble tax” in mark up. The tax is worth around $50 billion in revenue. Currently, the committee has $86.5 billion of space before reaching the $1.5 trillion reconciliation target. While originally created to prevent Americans from abusing deductions and credits to avoid a tax burden, the alternative minimum tax (AMT) actually negatively impacts many honest taxpayers, including those in the middle class. The Tax Cuts and Jobs Act would repeal the AMT, delivering on a long-stated Republican goal. Certain aspects of the state and local tax (SALT) deduction, specifically the state income and sales tax, are eliminated. Full elimination of the SALT deduction, which includes state and local property taxes as well, has a ten-year price tag of $1.8 trillion without macroeconomic feedback. Full elimination has found significant resistance from Republicans from high tax states like New Jersey and New York. There are only 14 Republicans in the House from these two states, and Republicans can withstand only 21 defections to pass a tax bill assuming no Democrats vote for it. Due to the thin margin, Chairman Brady and Republican leadership have allowed the state and local property tax deduction to remain in place, capped at $10,000 per filer, if the filer chooses to itemize rather than claim the standard deduction. The mortgage interest deduction continues to exist, capped at $500,000 of principle, for new home purchases. Again, only those who itemize will be able to claim this deduction. The deduction is not allowed for second homes. Current mortgages up to $1,000,000 are grandfathered. Because of the increased standard deduction, the House Ways and Means Committee believes that the mortgage interest deduction will not be taken advantage of like it has been in the past. The Tax Cuts and Jobs Act proposes to permanently repeal the estate tax, commonly referred to as the “death tax.” The bill increases the exemption to $10 million through tax year 2023. Beginning in tax year 2024, the estate tax is permanently repealed. Undoubtedly, some are frustrated not to see an immediate repeal of the estate tax. FreedomWorks shares that frustration. Nevertheless, the six-year phase-in makes the math work with the $1.5 trillion deficit allowed by the FY 2018 budget resolution. While the Tax Cuts and Jobs Act eliminates or significantly modifies some existing tax deductions, including the personal exemption, the bill would expand the child tax credit to $1,600 and increase the phase-out threshold to $230,000 from $110,000. Only the first $1,000 is refundable, although it is indexed to inflation. An additional $300 personal tax credit is created and a separate $300 credit is provided for non-child dependents. The additional credits have a five-year sunset. The bill makes significant changes for pass-through businesses – such as sole proprietorships, partnerships, S-corporations, and limited liability companies (LLCs) – that are taxed through the individual tax rate structure. As a result of this tax treatment, some of these pass-through businesses are falling victim to higher tax rates. 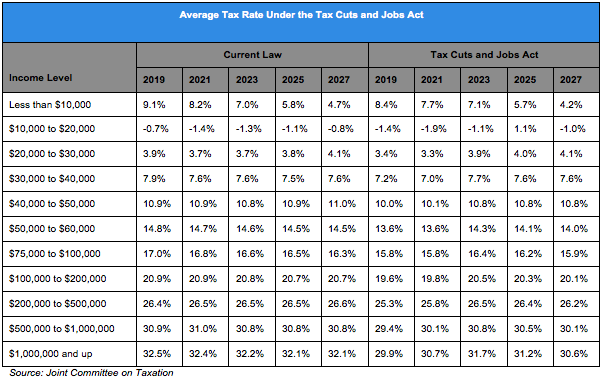 The Tax Cut and Jobs Act would reduce the pass-through, or small business, tax rate to 25 percent. There are, however, some significant caveats to this, as the bill also includes limitations to prevent abuse. Tax-writers make an assumption that the 30 percent of income is related to the pass-through, allowing it to fall under the 25 percent rate. The remaining 70 percent will be treated as ordinary income, subjecting it to the regular individual tax structure. Pass-through businesses can seek to have more than the 30 percent of income taxed at the special tax rate, provided they can prove that more income qualifies to meet their circumstances. Professional service businesses – including accounting and law firms – will not qualify for the pass-through rate unless they provide proof of business income. The House Ways and Means Committee is likely to address the pass-through anti-abuse rules. Again, the committee has $86.5 billion of space to address this concern as well as others during markup. The Tax Cuts and Job Act would make several major changes to corporate and small business taxes that are designed to promote American competitiveness, economic growth, and job creation. An early report suggests that the goal would be accomplished. This starts with elimination of the “worldwide” tax system, shifting the United States to a territorial tax system. Currently, the statutory corporate income tax rate is 35 percent. Combined with state corporate tax rates, the top statutory corporate tax rate in the United States is 39.1 percent, which is the highest in the world. (The average effective corporate tax rate is 29 percent.) The average corporate tax rate of countries in the Organization for Economic Co-operation and Development (OECD) is 22.5 percent. The Tax Cut and Jobs Act proposed to reduce the corporate income tax at 20 percent. Although there was speculation that the 20 percent corporate income tax rate would be phased in over time, the text shows that it will be immediate, beginning in tax year 2018. The 20 percent rate is permanent. The bill would provide for the full and immediate expensing of capital investments. This provision last for only five years. The deduction limit for Section 179 expensing is increased to $5 million from $500,000. The cap is increased to $20 million from $2 million. The alternative minimum tax for corporations would be repealed. The Tax Cut and Jobs Act would also provide for the repatriation of overseas profits and cash equivalents at a 12 percent rate. A 5 percent rate is provided for illiquid assets. Tax-writers hope that these provisions will bring the estimated $2+ trillion in cash and assets back to the United States. These are the highlights of the corporate and business tax reforms. There are several other changes to the corporate tax code under this bill. Note: There are mentions of provisions being made permanent. Obviously, a future Congress can change these provisions at any time. For sake of this bill, permanence means that it extends beyond the ten-year budget window that the Congressional Budget Office (CBO) measure – which, in this instance, would mean 2018 through 2027 – absent congressional action to change the law. Because this bill falls under the complicated rules of budget reconciliation, permanence is an important part of the equation as Congress moves forward. Reconciliation requires deficit neutrality, which can include changes to outlays, in the second ten years, 2028 through 2037, for provisions to be permanent.